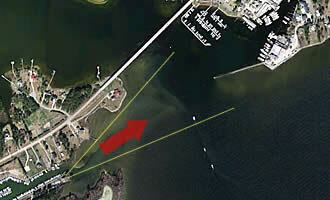 PecamCam looks at the channel entrance to Pecan Grove Marina. All boats entering or leaving the marina pass through the channel, along with the fishing boats from Endurance Seafood. The cam takes photos from dawn til dusk – the exact times change through the year as the seasons change and are posted on the PecamCam page. Check the PecamCam slide shows. You’ll see boats come and go, the weather change, the waves build, the sun rise, the sun set. There are 24 hours of archives. The 24 hours of photos usually means about two days are stored (given the cam does not take photos when it’s dark). When viewing the slide shows you can “stop the show” by simply putting the cursor anywhere over the photo. The show will freeze while the cursor is over the photo – then resume as soon as you move it off.